Art that you can eat! 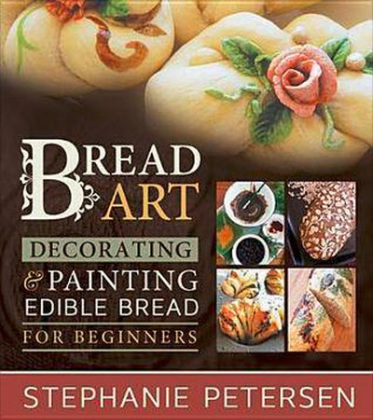 In this accessible, step by step handbook, professional baker Stephanie Petersen guides beginners and experienced breadmakers through the shaping, painting, twisting, and embellishing used to bake show stopping edible creations. With Bread Art s beautiful instructional photos and delectable recipes, you'll be whipping up masterpieces in no time! The food storage cook book contains 225 full-color pages, packed with 143 incredible recipes, including: 9 Appetizer recipes, 9 Breakfast recipes, 6 Bean recipes, 14 Side Dishes, 5 Whole Grain Snacks, 6 Rolls, Sweet Rolls, & Freezer Bread recipes, 12 Whole Grain Bread recipes, 13 Dessert recipes, 31 Gourmet Mixes, 4 Holiday Soup Mixes, 9 Gluten Free recipes, and 25 of her highly popular 52 Method: Meals in a Jar recipes. By popular demand, Chef Tess wrote this book all about meals in a jar. Meals as easy as 1--2--3! Just add water and dinner is done. Using Chef Tess s tried and tested dry--packing method, learn how to make meals that are not only delicious and family--friendly, but also shelf--stable for an average of 5-10 years. Enjoy recipes like Broccoli Cheese and Rice Casserole, Chunky Italian Spaghetti, and Spicy Chicken in Peanut Sauce, all from a jar! This is a spice blend that is near and dear to my heart. Not only do you get my personal version of a garam masala, but your part of your purchase goes to help kids in need in India. Packaged in collectible glass bottles adorned with artwork by Erik Johnson. Chef Tess Spices are a must have in any kitchen. Chef Tess designed four amazing seasonings that go with almost any meal! This bundle pack gives you a well rounded amount of flavors, spices, and sweetness. Includes: Southwest Fajita, Romantic Italian, All Purpose Mix and The Wise Woman of the East. Chef Tess Specialty Spices go above and beyond any normal spice blends. These four mixtures transform the extra ordinary into extraordinary! Take your flavors to the next level, turning your well loved recipes in to culinary perfection. Includes: Greek Olympian, The Big Dill, French Provencal Essential and Amazing Wok-Star.